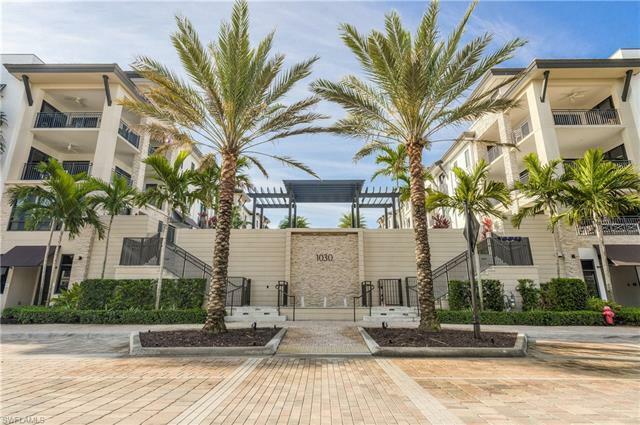 1030 3rd Ave S #410, Naples, FL.| MLS# 219027117 | Bonita Springs, Estero, Naples, Fort Myers Beach FL Real Estate | Marie Pimm PA Realtor. Representing U.S. and International Buyers and Sellers in the purchase and sale of investment or personal property. Marie is a skilled 1031 Exchange Realtor. Welcome to sophistication in Naples Square. This Essex unit, Boasts almost 2500 sq/ft of upscale living, including 3 bed + Den and 4 baths. Countless views can be enjoyed from the gourmet kitchen with upgraded Viking appliances, upgraded marble countertops, all balanced by the light and bright great room. This split floor plan offers ultimate privacy and open concept. The Deep oversized terrace overlooks all of Naples Square finest outdoor amenities, including the pool, spa and outdoor kitchens. Residents are able to exercise in the state-of-the-art fitness center within the building or entertain guests in the upscale social room, complete with chefâs kitchen, billiards table and large screen TVâs. Located within walking distance to world class shopping and dining on 5th Ave South. This is Naples Condo living at its finest!